On December 12, 2010 in an upscale Long Beach neighborhood, police officers shot and killed a man while he was sitting in his enclosed back yard holding a garden hose. It was 4:40 P.M. on a Sunday afternoon. The man was shot several times by the cops because a neighbor falsely reported he had a gun. A better outcome happened Friday June 4, 2009 on the city streets of San Diego. At approximately 12:40 P.M. we also became victims of a police Hot Stop. A Hot Stop occurs when several officers from multiple jurisdictions threaten to use overwhelming firepower to subdue a suspect. In this case, the foreman of a construction company (according to Internal Affairs) generated the Hot Stop when he told the 911 dispatcher that David Beck-Brown had a gun. He didn’t. The guy lied. The unarmed man in Long Beach was also surrounded by police in a Hot Stop and was killed by a barrage of gunfire. One bullet will harm someone. Multiple bullets fired point-blank from several loaded guns will result in assassination. What will it take to start holding law enforcement accountable for murder? The following excerpts are taken from a Q&A pamphlet compiled by the San Diego Police Department (SDPD) and mailed anonymously to Sharon Bair. Keep this pamphlet on you. It may save your life. When is a police officer required to advise me of my rights? When the officer places an individual in custody he must give Miranda rights. The SDPD did not give either of us our Miranda rights prior to placing us both in handcuffs behind our backs. If an officer stops and detains me, do I have the right to walk away? The officer cannot detain you unless he has a reason to believe you may be involved in a crime. Every official detention should be documented per police protocol. Sharon has yet to receive this document. Can an officer reach into someone’s pockets without a search warrant? The officer can only go into their pockets after placing a suspect under arrest, or with their permission or when a weapon is felt during a pat down. Both of us were searched while in handcuffs and prior to David being falsely arrested. Can an officer order me to get out of my car during a traffic stop? Yes. The law does allow the officer for his own safety to order someone to stay in or exit the vehicle during a traffic stop. What about our safety? We were told to exit the vehicle directly into harm’s way as multiple police cruisers were surrounding us with weapons drawn. Am I required to carry identification with me? No. Carrying identification is not mandatory in the U.S. Apparently it was of interest on June 4th because the SDPD confiscated Sharon’s passport. A friend of mine was stopped. I tried to explain to the officer that they had the wrong person, but I was told to leave or I would be arrested. What should I have done? The best thing for you to do in order to help your friend is to become a good witness to the event. Don’t become involved in a debate with the officer. This could be considered unlawful interference. Does “unlawful interference” supersede being arrested as an accomplice? How about for being complicit? Technically Sharon should have been arrested for one of the three. Does the officer have to give me his badge number? 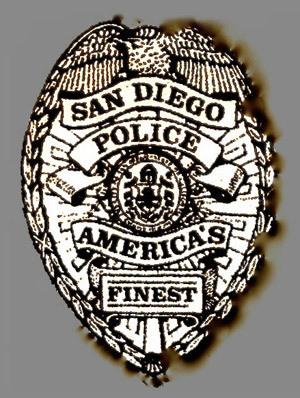 The San Diego Police Department requires its officers to provide name and employee I.D. number when requested. This is why in addition to writing down badge numbers you should notice the physical characteristics of an officer. It’s possible the badge is just that ~ an item to be pinned to one’s uniform. If I get a traffic ticket, do I have to sign it? Your signature is required on the citation in order to be released. Failure to sign means the officer cannot release you and will take you to jail. Whew! Good thing Sharon signed her cell phone ticket from the CHP on the way home. It would have been hard to be a “good witness to the event” had she ended up in jail too. How many officers are necessary to arrest one person? When the situation appears potentially dangerous, units may be asked to back up the first officer arriving on the scene. We’re still trying to answer this one with an exact number. In our case it’s at least 24 if you consider a dozen police cars times two law enforcement occupants. How many people ride in the helicopter? Add that to the equation and the number goes up. If a police officer has to use his gun, why not just shoot the suspect in the arm or leg? When a police officer is forced to use his firearm, it is a life-threatening situation that requires the officer to stop the threat immediately. Additionally, in a tense situation, shooting at the moving arms or legs of an individual is extremely difficult. We were the ones in a life-threatening situation. It was definitely tense for us, and our appendages weren’t moving. Probably a good thing for the guy with the kill shot pointed at Sharon’s face because he just might have nailed an arm or a leg, or worse. What will happen to the officers if I file a complaint? The complaints will be investigated. If their actions were improper, they will be disciplined. However, by law (832.7 P.C.) we are prohibited from telling you what disciplinary action was taken. True. The police department is prohibited from telling you what disciplinary action was taken because all cops are protected under the Police Officer Bill of Rights (POBR). However the information here in the pamphlet is misleading. Upon further probing, Penal Code 832.7 states peace officer personnel records are confidential and shall not be disclosed in any criminal or civil proceedings except by discovery pursuant to Section 1046 of the Evidence Code and Section 1005 of the Civil Code. In other words, you DO have the right to know what disciplinary action was taken. They just don’t want you to know that. Our concern is that the City Attorney advises the Citizen’s Review Board (CRB), the SDPD Lieutenant in charge of Internal Affairs sits on the CRB and the Mayor can veto any decision the CRB makes. Therefore we recently forwarded our complaint to the State Attorney General’s office and were told to wait a “reasonable amount of time” to settle at the local level, the local level being the aforementioned Kangaroo Court. It has been 19 months since the Hot Stop and 10 months since we filed our complaint. I think that’s a reasonable amount of time to wait for a desired outcome. Hopefully the FBI will agree. On the other hand, what if I wish to compliment an officer? If you have experienced good service from a member of the Police Department, we want to hear about it. Please write down all the details including dates, times and circumstances. We agree. This is why we applauded the Multi-Cultural Community Resource Officers (MCCRO) in person to Chief Lansdowne at a recent San Diego Police Foundation Luncheon. Bair and Beck-Brown’s interview about their Hot Stop experience will be aired on San Diego Public Access TV, Truth to Power, in the near future. 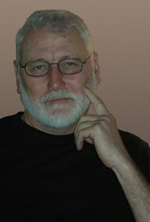 Beck-Brown has worked at County, State and Federal lock-ups since 1977. He left the prison system 27 days after the Hot Stop. Bair is a teacher of the deaf, mother of two and was detained during the hot stop. Bair is working with Beck-Brown to hold law enforcement officials accountable for their actions.